This is the CUHWC Trip Leaderboard, which records statistics relating to members' participation in Club trips using 4 'Boards'. 'Official' CUHWC weekend and day trips are counted from the final trip of Michaelmas Term 2003 and the Scottish summer trip is counted from 2005. 'Official' normally means that the trip was advertised to the main mailing list, partly explaining why foreign trips are not counted. These dates are selected because this is as far back as the data currently extends. If your Club membership predates 2004 and you calculate how many trips you went on before then, you can get yourself moved higher up the board by emailing Ben (bjrh3) in order that he can enter you at your correct position; otherwise, you'll be ranked on total since Michaelmas 2003 only. These figures are intended to arouse interest and drive friendly competition (i.e. trying to move up the boards), not cliquishness, jealousy or rivalry. Use sensibly! The leaderboard was initially created and updated by Mark Jackson, and has since been maintained by Andrew Williamson, Ben Brunt and now Ben Harris. 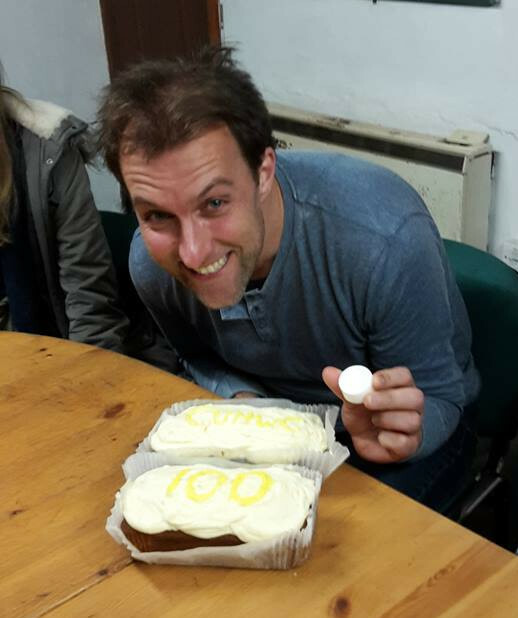 Paul C celebrates his 100th trip with CUHWC (Coniston, New Year 2018). Photo: Sarah Ma. This is the total number of trips in which an individual has participated. Someone is deemed to have participated in a trip when they were involved in at least one walk on the trip (which, normally, is indicated by the presence of their name on a CUHWC route card). When a person was involved in trips pre-2004, the number in square brackets after their name denotes the number of trips attended before the final trip of Michaelmas Term 2003 (to Ennerdale). Currently active members (i.e., people on Board 2) are in bold. These are the figures for the last 14 trips, normally representing the last year's worth. In cases where fewer than 14 trips were run in a year, this covers a period of over a year. This represents more of a rolling snapshot. Try and move up the board rather than down! Current Committee members are in bold. This is the highest position an individual reached on Board 2, indicating the most trips in which an individual participated over a year. (N.B. This technically accounts for only the last 14 trips, so may not necessarily represent a 'year'.) This sort of measures each person's 'maximum keenness' and when they first reached it. 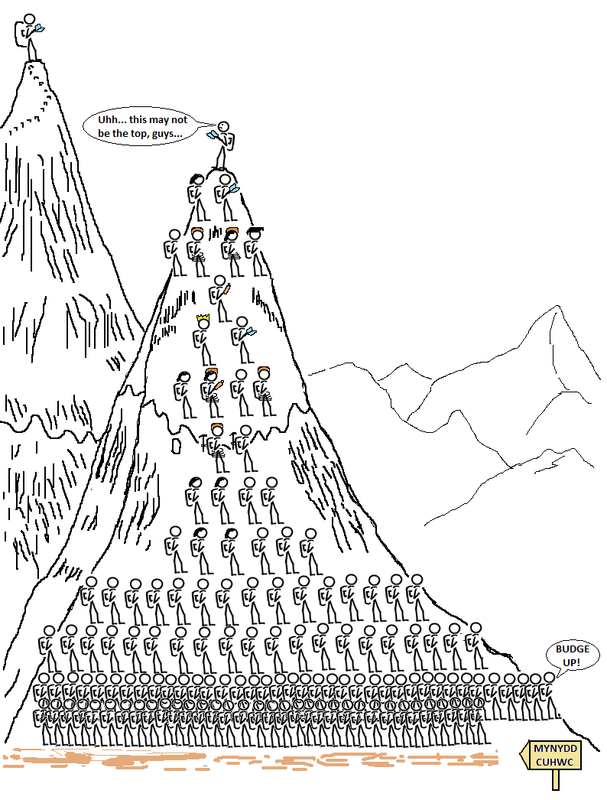 Currently active members (i.e., people on Board 2) are in bold. Getting your name on or moving up this board requires a different kind of dedication, such as not missing day trips. Currently active members (i.e., people on Board 2) are in bold. Valerie A celebrates her 50th trip with CUHWC (Capel Curig, Lent 2015). Photo: Yining N.